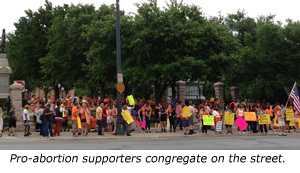 Austin, TX, July 9, 2013 (OperationRescue.org) — Thousands of pro-life supporters jammed together in front of the Texas Capitol Building on yesterday's hot, muggy evening to hear notable speakers such as Lt. Gov. David Dewhurst, Attorney General Mike Abbott, and Fox News personality former Gov. Mick Huckabee speak in support of a Texas abortion law that was thwarted by an angry pro-abortion mob two weeks ago. The rally had a street-fair quality, with a sea of blue-shirted pro-lifers cheering and chanting, ”Pass the bill,” while abortion supporters sporting orange clothing occasionally recited mantras such as, “Separate Church and State.” The pro-abortion chants were generally ignored and drowned out by the enthusiastic throng, which took every opportunity to punctuate the speakers’ messages with hoots and cheers. There was a palpable sense of history in the making. As the pro-life rally progressed, abortion supporters congregated on the street in front of the Capitol, chanting and cheering at honking cars as they whizzed by, all under the watchful eyes of at least 15 motorcycle officers who lined a section of the street nearby. Security was high and there were no noticeable incidents, at least as far as this writer could see. It is sometimes difficult to measure a crowd of that size, but estimates were between 3,000 to 5,000 pro-life supporters rallied outside the Capitol, with hundreds more inside wandering the halls of the Capitol. Others jammed into several over-flow rooms to watch closed-circuit broadcasts of the Senate Health and Human Services Committee as they patiently endured a marathon of speakers who had signed up to speak both for and against SB1, the Senate companion bill to the House version known as HB2. These bills would ban abortions after 20 weeks gestation and provide additional regulations, such as the requirement that abortionists must have local hospital privileges. 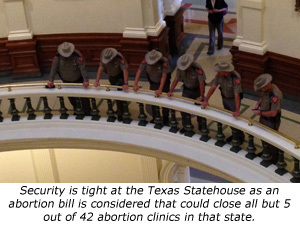 If successful, it would close all but 5 out of 42 abortion clinics in Texas. The Senate hearing was expected to last all night. “We’ll stay here the rest of the week, if necessary, to hear witnesses,” said Republican Sen. Jane Nelson. The testimony will continue round the clock until the last witness is heard. Literally thousands more registered their support or opposition to the bill by submitting a form in person outside the hearing room. Sen. Nelson indicated that there would be no vote immediately following the hearing, signaling that the Senate may be content to move forward at a slower pace than the House, which heard eight hours of testimony last week and has scheduled a vote in the full House on Tuesday. This is the second special legislative session called by Gov. Rick Perry to ensure passage of the pro-life law. Texas has a part -time legislature that meets only once every two years. Adding to the urgency of passing the abortion restrictions this year were recent allegations of three former abortion clinic employees that Houston abortionist Douglas Karpen routinely kills late-term babies born alive during abortions using practices similar to those of convicted murderer Kermit Gosnell. Operation Rescue released photographic evidence depicting two late-term babies that seems to support the women’s claims. Operation Rescue will be Tweeting live from the Capitol Tuesday. Please join us in tweeting support for the Texas pro-life legislation by using the hashtag #Stand4Life. Follow us at https://twitter.com/operationrescue.